Having sussed making the elemental feeds, and NGT management having quickly become second nature, our final challenge was to learn all about the small piece of equipment that is going to become a key member of our household for the next few months – the pump. 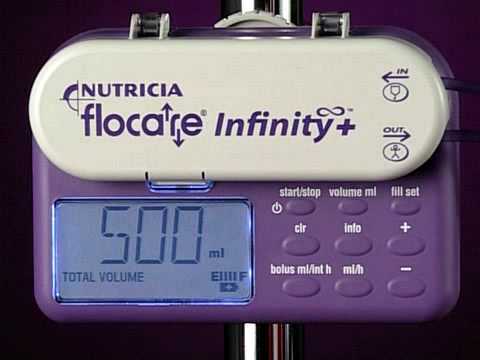 M has the Flocare Infinity pump from Nutricia, which has proved to be easy to handle and quick to program. I was trained in just 40 minutes whilst M was still admitted at GOSH and even though it all felt rushed, it was actually all I needed and I was just about confident enough to go home with him 2 days later. Our excellent Nutricia nurse, from their local community nursing team, came out to train Mike the day after M was discharged and she has also held a training session at school to ensure key members of staff are up to speed with what they need to do during the school day. The set-up is easy. The first thing we have to do is set the volume of the feed – either 1000mls or 500mls for M – and the rate in ml/h, which we set to 150 ml/h. The pump retains the information from the previous feed, so it is important to check that these 2 figures have been set correctly for the feed you’re giving. I then press the “info” button, which tells me the exact dosage that was given to M in his previous feed and clear this number from the pump’s memory. This records how much of the required volume has been given since the pump was started, so if you don’t take care to delete the previous information, you could find yourself giving a lot less than the required amount. The pump is then attached to the feed bottle via a feeding kit, which is a length of tube that joins the bottle to the NGT via the pump itself. 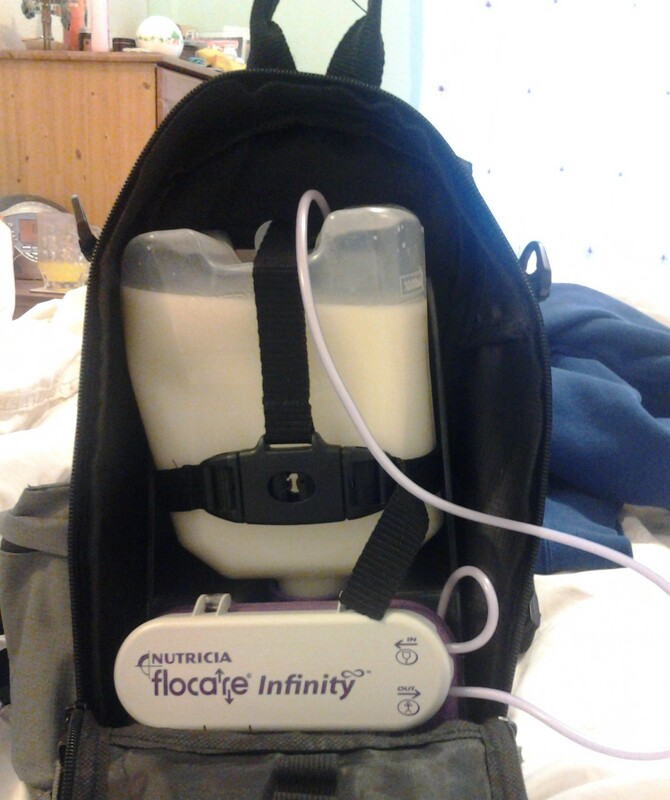 We were provided with a small plastic stand, which holds the pump at the bottom with the bottle hanging upside down above it, firmly strapped in place. The feeding kit is attached to the top of the bottle, threaded around the pump stand, carefully avoiding getting it trapped between pump and stand, and then looped around the mechanism inside the pump. Before connecting the loose length of the feeding kit to the NGT. you need to fill the entire length of the feeding kit tube with the feed to make sure you’re not pumping air into your child. We were shown to do this using the “fill set” button, which runs at the fastest rate possible and takes seconds to fill up. Once this is done, it’s simply a case of attaching NGT to feeding kit tube and pressing start. All being well, the feed is now underway and, in an ideal world, you can leave the pump alone until the feed is finished. However, reality is very different and you will quickly become attuned to the beeping of the pump alarm. It can and will beep for any number of reasons: there’s air in the tube, the tube has become kinked or blocked on the way into the pump mechanism, the tube between the pump and your child’s NGT has been kinked/blocked/sat on/folded tightly between your child’s fingers such that the formula has no place to go or sometimes, just because. Sometimes the alarm is easy to resolve, simply a case of stopping the pump, removing the air/blockage/kink and restarting; but sometimes no amount of jiggling wires, shaking formula bottles or removing everything from the bag and the stand will stop that alarm sounding every 5 minutes or less. We’ve even tried that old IT support favourite of switching it off and then on again and have had limited success in silencing the beeping for more than 5 minutes. Both G and M know how to switch the alarm off, but both are guilty of occasionally forgetting to make note of what fault featured on the digital display, leaving it to my superior Mummy detective skills to work out exactly what might have caused the problem that time round. Nevertheless, the odd mad beeping episode aside, the pump generally does what it should and copes in an admirable fashion with being bounced around on M’s back for 10 hours a day. So this little purple pump has become our new best friend. Just like a favourite fashion accessory, we rarely leave the house without it or the trusty back-pack. M can do almost everything whilst wearing it and has become adept in the art of adapting to its very presence in his everyday routine. And whilst it is ever-present, we’ve learnt to have a laugh and have attributed it with its very own personality. Some of the lovely FABED family shared that naming the pump helped make the whole experience easier and more fun for their child and one Mum even said that the pump reminded them of a minion. 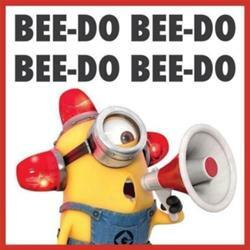 This latter idea made all of us smile because we knew instantly what she was referring to: the incessant beeping of the alarm which is hard to distinguish from the “Bee-do bee-do” heard from the Fireman minion who helps put out Gru’s office fire. Of course, even though M’s pump bears more resemblance to one of the evil purple minions from Despicable Me 2, bent on a path of destruction, it’s hard work and support in providing M with the means to have the nutrition he needs is far more comparable to their loveable yellow counterparts. Disclaimer: I am not a medical expert and this blog does not constitute medical advice. I have detailed how we have been taught to run M’s pump by the professionals involved in his care. Please note that any questions concerning a feeding pump and the associated kit should always be directed to your medical team. This entry was posted in Chronic Illness, Hospital, Special Needs Parenting and tagged Allergy, Awareness, Conditions and Diseases, Education, EGID, Eosinophilic, FABED, family, Flocare infinity pump, food allergies, friends, GOSH, Great Ormond Street Hospital, health issues, ill health, Infinity pump, NG tube, NG tube feeding, NGT, Nutricia, parenting, pump feeding, school, tube feeding on February 16, 2015 by bluesingingdragon. So M has a minion? No good can come of this! Excellent review of this bit of kit. One that I use every day at work. Well done M for adapting to this stage of your life! Thanks Pam – glad to know I was reasonably accurate in my description!